(ED NOTE: The following blog first appeared in Charleston Skirt Magazine at http://bit.ly/1W1bZM5). I moved to Charleston in 2013 without knowing a soul here other than my husband. I wondered whether the city would ever feel like home. But people were kind and they would take the time to have coffee or even dinner with me. I didn’t mind that I was the one to do the asking every time, even if it stung my pride just a little. After all, I was the one trying to find new friends; the others already had their circles and, while they didn’t exclude me, they had no reason to think of me as they planned outings, either. I loved Charleston, but was it home? Visits back to the DC area where old friends and neighbors lived were always visits “home” for me. And then June 17, 2015, not even a five-minute walk from my house, the unthinkable happened. Peaceable people mown down by an angry, bitter young man with easy access to a gun. Footage of faces both grieving and numb right there – right there! 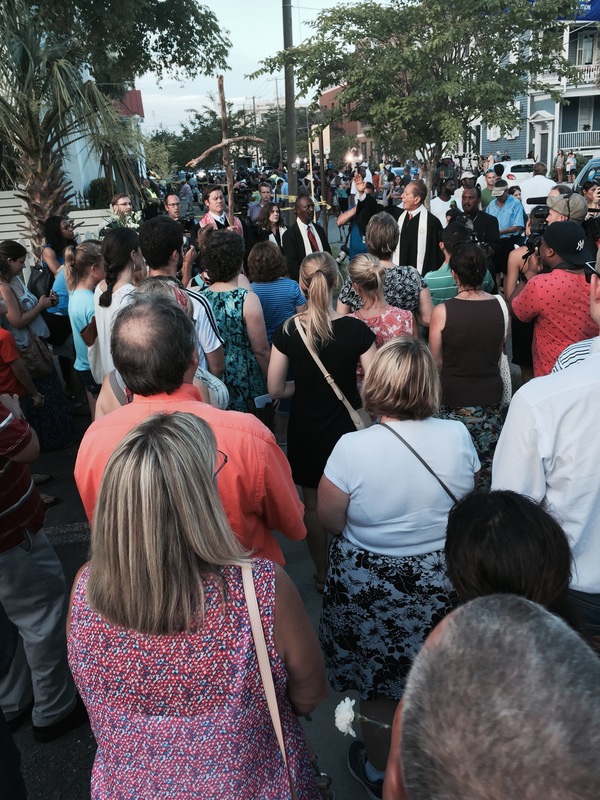 – where I’d stood to watch the many silly parades Charleston loves to hold. The curb where I’d stood with my leashed dogs watching decorated cars and costumed people strut past for Christmas, and St. Patricks’s Day, and Martin Luther King Day. A New York newspaper called me right away and asked whether I could use my proximity to interview people. They would hire me, they would pay me well, to bring Charleston’s story to the world. My home, but not my home. The next days, after the police told us it was safe to go outside again, that the armed gunman wasn’t in our neighborhood and on the loose anymore, strangers on the streets spoke to me and I to them. Black and white, speaking with the tentative tenderness that a married couple shows after the kind of vicious fight that could have taken down the whole marriage. On Marion Square. Up and down Calhoun, in and out of King Street stores. We were the same, those people and I. They were my family. The tenderness I felt was for them, it was for the city. It was the tenderness I felt for my home.